Could Your Business Use a New Telephone System? Telephone solutions have long been a major pain point for businesses. Smaller organizations attempt to get the most bang for their buck, especially for something as important as communications, but it’s not always so simple. How can you get the greatest return on investment from your business’ telephone solution? You can start by implementing Voice over Internet Protocol. VoIP uses your business’ Internet connection, rather than telephone lines, to transmit your voice to the recipient, and it has the potential to completely change the way your organization operates. Here are six benefits that your business can gain from VoIP. Since VoIP uses your Internet connection--or, rather, your IP address--to send calls, you’ll get more value out of your telephone network in the long run. This is especially true for long-distance calls. As long as your bandwidth can handle the additional strain, you actually save money by implementing VoIP. When you implemented your office telephone solution, you installed lines that run directly to specific handsets for each of your employees. This makes changing numbers or moving offices a huge pain, as you would typically need to contact the telephone company to get your services transferred elsewhere. VoIP eliminates this issue entirely and provides your business with the freedom to move things around as you see fit. 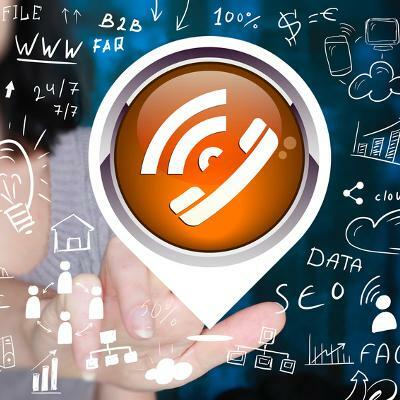 You may have all of the traditional telephone services with your landline connection, but more advanced features are likely out of reach for you. VoIP offers plenty of features, such as voicemail transferring, video chat, instant messaging, and much more, so that you can spend your time wisely during a telephone call. While VoIP provides great additional features that you can customize as your needs see fit, you still retain access to all of the basic services that make the telephone such a great solution in the first place. You’ll still retain access to conference calling and call forwarding the same as usual, so there’s plenty of room to grow and add services as your business needs change. Have you ever had the phone ring in your office, but you’re simply too busy to answer the call? Well, with VoIP, there’s no excuses. You can have the call transferred to specific phones or devices if it’s not answered within a certain number of rings. This improves your business’ reputation with clients. More than anything, VoIP can be used on multiple devices. It can be accessed through mobile devices, or on a desktop or laptop. You can even use traditional handsets if you so desire. It’s a highly customizable solution that your business can leverage to its advantage. White Mountain IT Services can equip your business with a powerful, enterprise-grade VoIP solution designed to work for your business. To learn more, reach out to us at 603-889-0800.